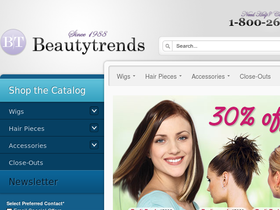 Shop for your next wig or hairpiece at Beauty Trends, online at BeautyTrends.com. With a wide aray of products such as monofilament wigs, human hair wigs, hand-tied wigs, men's hairpieces, ethnic styles, 3/4 caps, clip-ons, comb-ons, and wiglets, you are sure to find exactly the hairpiece that you are looking for. Find top brands including Revlon, BT Classic, Beauty Trends, Carefree Me, La Vie, and Beverly Johnson. Search for the best Beauty Trends codes, Beauty Trends discounts, and Beauty Trends coupons at RetailSteal.com. Beauty Trends' shipping rate depends on the customer's order, but free shipping and very low shipping promotions occur often. If you are not satisfied with your purchase, you may return within 60 day for a refund but are subject to a $15 restocking fee. Shop at Beauty Trends today and use our coupon code to receive a $15 discount on your purchase $225 or more. Shop at Beauty Trends and enjoy free shipping on orders $49+. Click here for code. Use the coupon code and get $10 off your order of $49+ at Beauty Trends. Click link to save. Save up to 85% on last chance close-out deals at Beauty Trends. Click to shop. Use this coupon code at BeautyTrends.com and enjoy free shipping on your order of $100+. At Beauty Trends, save an additional 30% on closeout items. No coupon neccessary; click link to save. Rest assured you're getting the right color with Beauty Trends and their free color swatches. Request a free catalog from BeautyTrends.com. Click link and shop. Save $5 on purchases of $20 or more at Beauty Trends online today when you use our coupon code. Head over to Vogue Wigs today and shop Best Seller items for under $50. Click here. Use coupon code and get free shipping on your purchase $50+. Click here to save. Use this coupon code on Vogue Wigs to save $5 on orders $75 or more. At Vogue Wigs, take $30 off your order of $300 or more when you use the coupon code. Click link to shop now. Take 40% off clearance items online at Vogue Wigs. Click link for savings.